I guess I’m getting old, because I’ve caught myself looking more frequently at the obituaries section of the newspaper. Which is especially ridiculous, because I don’t know too many people in Maine! That said, I saw a really touching write-up on the front page of the Portland Press Herald that I wanted to share. In 1998, Brett Thomas Cooper was working in northern Maine as a whitewater rafting guide when he came across a head-on crash on a back road. He was an accomplished fly-fisherman, competitive skier, rock climber, kayaker, surfer and mountain biker, in addition to his later professional life as a surgical technician. “He lived a very full life,” said Christopher LaCasse, a friend since childhood. Mr. Cooper, who was a wilderness emergency medical technician, used CPR to assist a woman who had been injured in the crash. Now here is the amazing part. Thirteen years following the accident, the accident victim tried to locate her savior. They had not been in direct contact since the fateful day thirteen years before when she almost lost her life. She found Mr. Cooper via Facebook, and was distressed to learn that this active, vital man, only 34 years old, was now stricken with ALS (Lou Gehrig’s disease). Heather Richardson, the woman Mr. Cooper saved more than a decade ago, dropped everything, and became Brett Cooper’s personal caretaker in the final weeks of his life. “Heather would say that Brett was her angel and that now it was her turn to be his angel,” said Mr. Cooper’s sister, Brooke Cooper of Portland. I was in Lovell Library today, about 10 miles from my home. In the magazine section, I noticed a monthly periodical whose front cover blared some very aggressive anti-Israel headlines. When I opened the magazine, I saw that every single article in The Washington Report on Middle East Affairs was directed specifically against Israel, in the most vile terms, inciting its readers relentlessly. It was on par with Der Sturmer. As I’ve mentioned in previous posts, most residents in this part of Maine have probably never met a Jew in their lives. Politics are rarely debated, and I don’t think Israel is a country on everyone’s minds – – the attitude here is mostly rise early, work hard, deal honestly, mind your own business, and live and let live. World politics just aren’t part of anyone’s Weltanschauung. The only reason Iraq and Afghanistan make headlines is because so many young men and women from Maine serve there in the military. I told the librarian that I was surprised the library would carry such hateful and one-sided material. She replied, “Well, it’s a public library, and people have the right to express different opinions.” She suggested that perhaps I’d “find a counterbalance with The Christian Science Monitor.” Um. . . I don’t think so. Despite the politically correct “right to free speech” answer I received, I am unconvinced there is nothing to be done. That said, I would love to similarly donate a subscription of a pro-Israel monthly periodical . . . and I could not think of a single one! So, readers, if you have any suggestions I’d appreciate hearing from you. The sonei Yisrael (Jew haters) are clever and patient. Who would have guessed that their agenda would infiltrate the far reaches of the wilderness in Maine? I guess as Jews whose parents and grandparents lived and died during the Holocaust era, we should not be surprised: you can run but you cannot hide. 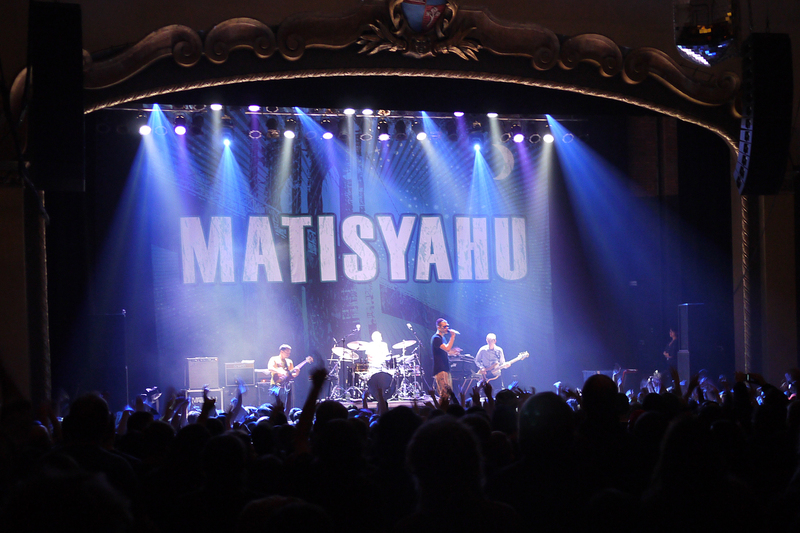 Warning: if you are a huge Matisyahu fan, you may not want to read this. A day after his Portland Maine concert, I’m not exactly feeling the love. First, the venue: the State Theater in Portland. This campy art-deco theater in the middle of downtown Portland was revitalized in 2002. The first third is the stage, the second third is a mosh pit, and the remainder is theater seating . . . which is superfluous when you’re talking about a Matisyahu concert, since people aren’t sitting, they’re standing and/or dancing. A nice thing: ticket prices were $25, a true bargain in this day of $100 tickets for major artists. 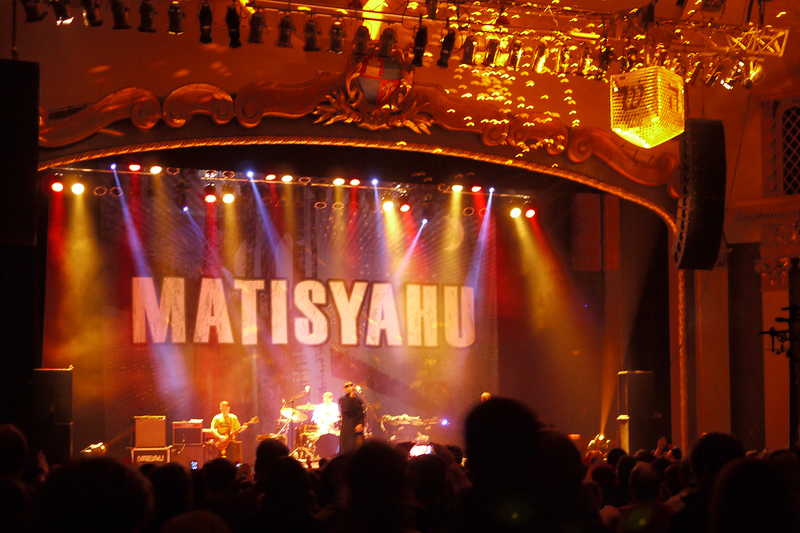 Thanks, Matisyahu, for being reasonable about this and keeping ticket prices down. There was open seating, another nice touch, so that you could sit with your friends if you had bought individual tickets at different times. Much angst led up to this concert. A couple of weeks ago Matisyahu shaved off his beard, creating lots of chatter in both the secular and religious world. Had he become enough of a legitimate musician in his own right to survive the entertainment industry sans beard, or was this hairy icon simply a gimmick? Did this mean that Matisyahu was chucking his Jewish observance along with his facial hair? Sounds to me like he needs whatever Divine mercy he can get. Maybe he should’ve kept the beard after all? So . . . four days after this incident, he finds himself in Portland. He must have been nervous, because he came on stage wearing sunglasses and a long coat, and his first song was sung in what only can be described as an aloof manner; he seemed oddly disconnected from the crowd. Ironically, there were plenty of flashes of light, but these came from his own light engineers, who spun strobes, spotlights, and a giant spinning mirrored dreidel (think disco ball from Saturday Night Fever, but in a dreidel shape) that flashed sporadically in the audience’s eyes as well as Matisyahu himself (at one point he literally hung trance-like over one of the very bright spotlights and peered deeply into it as the colored lights changed). Matisyahu, please note: all photos were shot without using a flash! But Portland isn’t Brooklyn. It wasn’t a visibly Jewish audience. Matisyahu clearly relaxed, the glasses and coat came off, and the songs he chose for the set (besides Jerusalem and One Day) clearly reflected that he was in “safe,” non-judgmental territory. At one point he even took a running leap into the crowd where he was bodily passed around the mosh pit (aka “stage diving”). The mostly college-age fans came without any agenda except to enjoy his music and rock to his beat and it was clear by his post-concert tweet that Matisyahu greatly appreciated that sentiment (“Portland Maine is officially now one of my favorite cities to play.”). There was surprisingly little singing by the star. Unlike his albums, where the sweetness of his voice really comes through, he relied heavily on the extremely talented and complex instrumentals of his band. It was a combination of reggae beat mixed with heavy rock and trance music. The guitar and drums were exceptional. Unfortunately – – and this is my main gripe about the concert – – the volume was so eardrum-puncturing, head-splitting loud that the clarity of his important lyrics were mostly drowned out or garbled. One didn’t really hear the music, one literally felt it. The throbbing vibrations resonated physically throughout one’s corporeal body and clearly transported many in the crowd (mostly reggae fans including several Rastafrarians) to spiritual heights – but not (for this listener) necessarily Jewish heights. I guarantee you his Portland fans will be wearing hearing aids in twenty years or less. Concertgoers included lots of “interesting” folk dressed to shout out their need for individual expression and uniqueness – ah, youth! The genuinely nice, young, friendly, and pleasantly rowdy crowd (this is Maine, after all) was extremely enthusiastic and very well behaved. Theater staff took precautions and had several bouncers with “Alcohol Enforcement” pasted on their T-shirts (upon entry to the theater, attendees were carded and when appropriate, given bracelets which allowed them to purchase alcohol sold there). The bouncers weren’t hesitant about removing potentially unruly or unstable fans. The whiff of marijuana was surprisingly faint (especially since “medical” marijuana is legal in Maine). Matisyahu performed only one beatbox number. I’ve heard him do amazing beatbox before, but this was not his night. Although the audience was appreciative, he sounded like that squirmy 8-year-old cousin who, bored at the Seder, just can’t sit still and starts making all sorts of annoying noises at the table. The final number (before his encore) was his best. He played “One Day” and pulled people from the mosh pit onto the stage, until the entire stage was jam-packed with undulating, grinning, and adoring fans. Sometime during this melee, a fan grabbed his yarmulke (yes, he is still an observant Jew, and wore a prominent maroon velvet yarmulke and tzitzis on stage). At the end of “One Day” Matisyahu left the stage, but he refused to come back for an encore until his manager explained to the audience, “whoever took Matisyahu’s yarmulke needs to return it. Right now. He’s not coming out until he gets it back.” Proffered baseball caps would not do. The yarmulke was returned by a sheepish fan and Matisyahu did come out for 1 1/2 songs. Kol HaKavod, Matisyahu! In announcing and advertising his “Festival of Light” concert, Matisyahu certainly made a big deal of his wonderful “Miracles” song, even asking fans on his webpage which version they preferred for his upcoming concert tour. So it was a bit of a surprise when he didn’t sing Miracles at all, finally relenting for his very short encore, but only singing an extremely abbreviated version of the song that was devoid of passion. Perhaps he is simply sick of it, but this fan wanted to feel something that was Chanuka-related about the concert beyond the spinning dreidel. 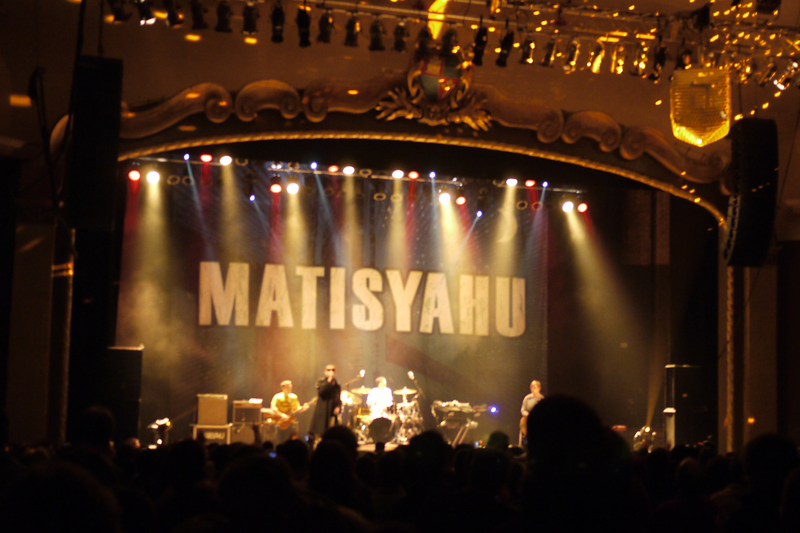 I went to this concert expecting to hear the Matisyahu I knew from his CDs. This was not the same Matisyahu, and even the familiar music was played completely differently. That’s not necessarily bad, it’s just different. Clearly the future will hold many surprises and we will see many changes from the artist, and I’m not talking only about beards. Matisyahu is really pushing the limit on this tour. He looked gaunt and pale and his most recent photos show dark circles under his eyes. I hope it’s just his crazy schedule that’s leaving him a bit run-down (I am a Jewish mother, after all). He is playing nearly every night and spending his days traveling 8 hours to the next venue. It’s a punishing timetable and sometimes it shows (who is really at their best and isn’t crabby when they’re exhausted?). My recommendation to Matisyahu: turn down the volume, first and foremost. Then come to visit us with your family in the White Mountains. We won’t even mention the b-word. Learn to appreciate that pristine quiet is also a form of music; it might help you find further inspiration and growth. I can guarantee you will connect deeply with HaShem. We’ll leave the light on. When you live in a rural place, word travels fast. “I hear you’re having a Chanuka party!” said our UPS man when he slogged up our driveway to deliver a package. Our UPS man is a genuinely nice guy. He always has a smile on his face, and is a great shmoozer. Our dog loves him, too – he always gets a biscuit or two from the UPS man. But our UPS man is not Jewish, so I couldn’t figure out how he would have heard about our party. Our party preparations were somewhat unusual. 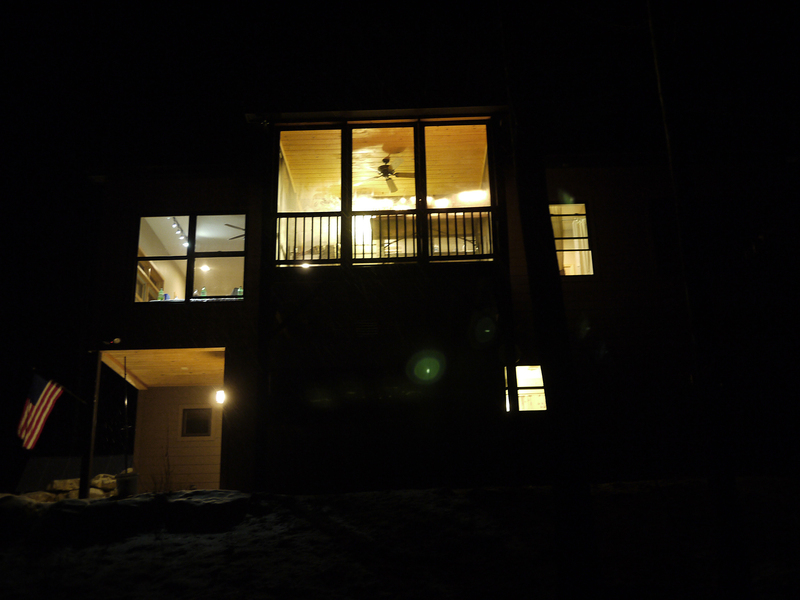 The night before, temperatures plummeted to 4 degrees and the morning of the party there was light snowfall. Unfortunately that meant that our driveway was impossibly slippery, so I had to notify all the party goers by phone and email that unless they had 4WD, they would have to wait at the bottom of the driveway and honk. My husband would meet them at the bottom with our SUV and lead them a mile up the road to the Inn, where they could park and my husband would shuttle them back to our house, up the driveway. 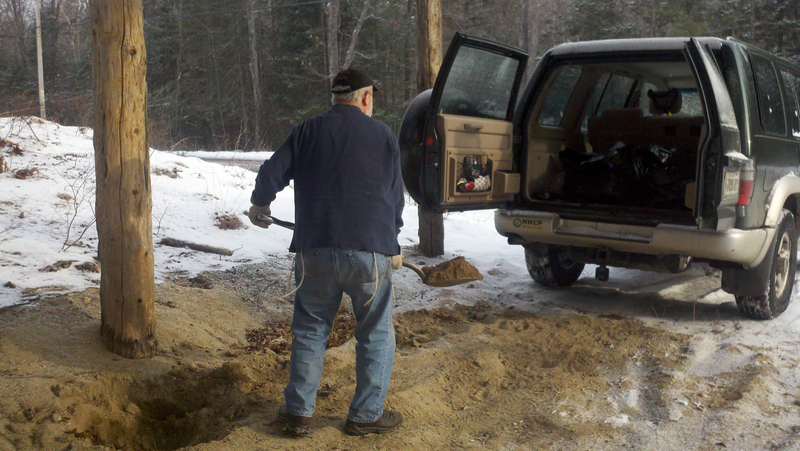 Around 1 pm the temperature had risen to 15 degrees but still no sun to melt the driveway, and we were low on road salt. 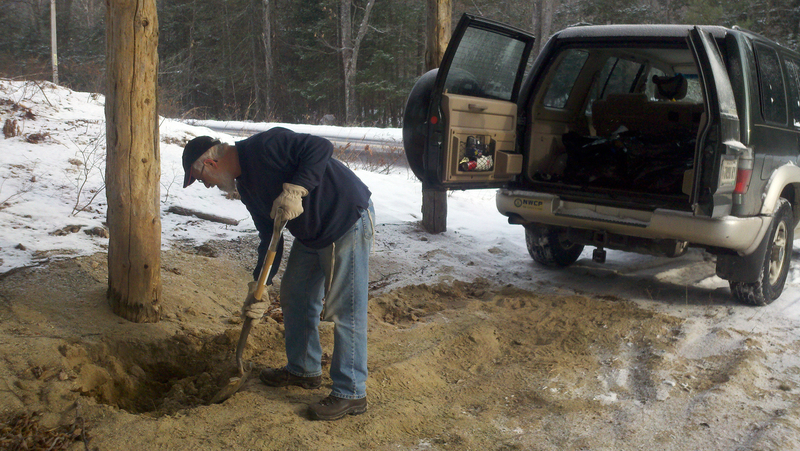 So we drove slowly to the Maine Department of Transportation’s sand lot, where we filled up the back of our car with sand and then drove back to our house. It was about 17 degrees outside and snowing lightly when we started digging. Cupful by cupful (I used a negel vasser cup) we spread the sand along the bottom third of the driveway, hoping it would provide traction for those brave enough to attempt the climb. We knew that we could not depend on our snowplow guy to come – he was probably with his family celebrating Xmas dinner and watching televised sports events on a very full stomach. About 2 hours before the party, we got a call from our friend two mountaintops over. “How’s your driveway?’ he asked. Which is ironic because P’s driveway is not plowed in winter, so he and his wife hike to the bottom every day to their car parked at the road below so they can get to work. That means that whenever they need to replenish their perishable food supply, they have to haul it up their mountaintop with backpacks – frequently in below-zero temperatures. But precisely because P empathized with our driveway situation, he offered to be the “valet parking service” for those guests unable to drive to the top. Indeed, he sat at the bottom of our driveway in his car in the freezing cold for over 30 minutes, waiting for the first guests to arrive, and he chauffeured many of our guests to our house. We got several panicked calls from guests who were lost; what made it worse is that they were in zones that had little or no cell reception so their calls were being dropped just as new directions were given. Many people came from quite far away, and due to the bad weather, what should have been a 90 minute trip took 2 hours. At last all the guests arrived, or so we thought (we would end up with a total of 27 people!). It was quite a mix of people; young, middle-aged, and elderly. Everyone was extremely friendly and enthusiastic. 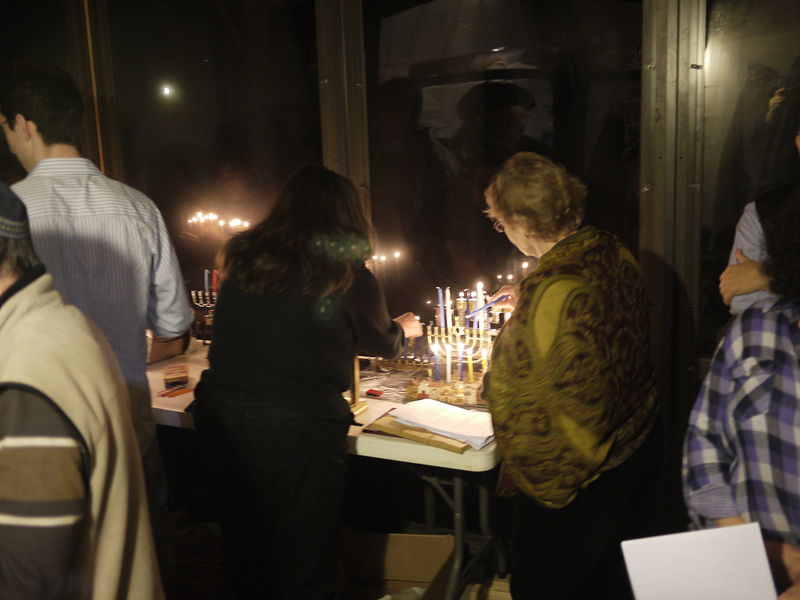 We set up our menorahs on the porch and did a group candle-lighting. 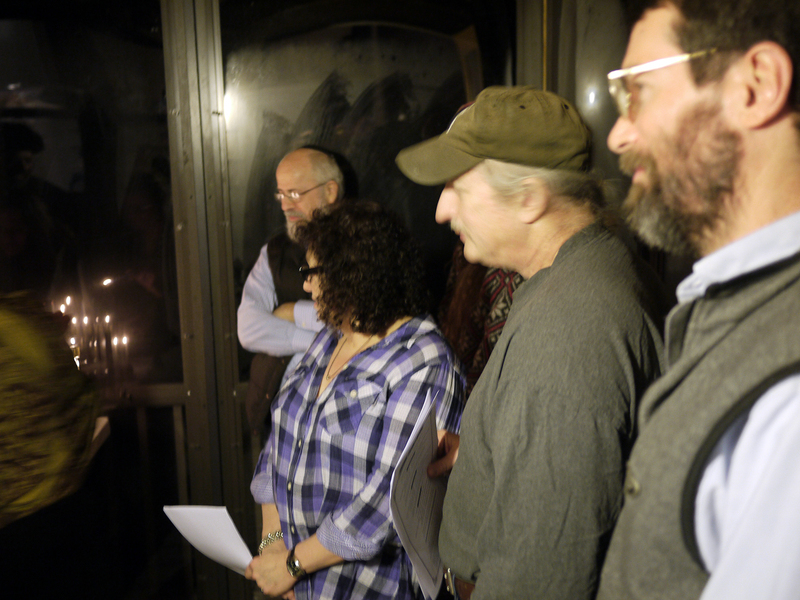 We returned inside and sang a rousing rendition of Ma’oz Tzur. 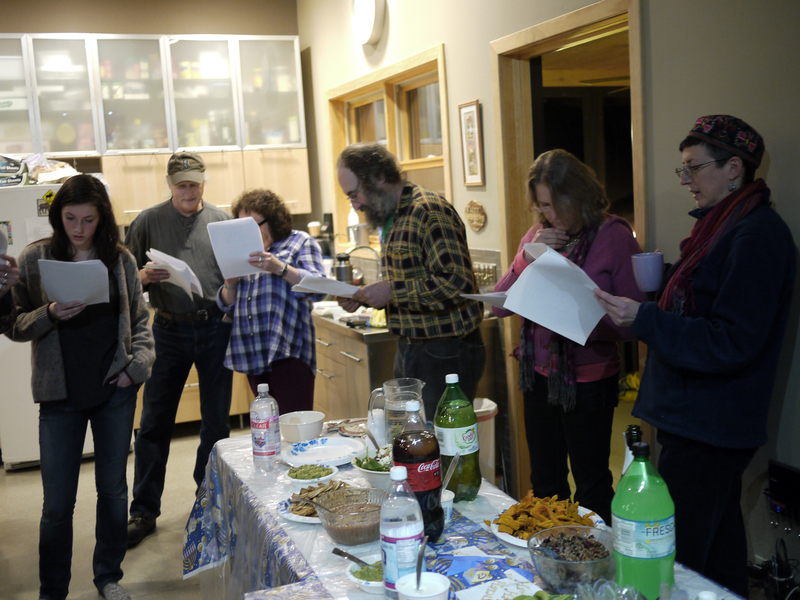 Fortunately I had pre-printed stapled song sheets with the blessings and songs in transliterated Hebrew, so everyone was able to follow along. 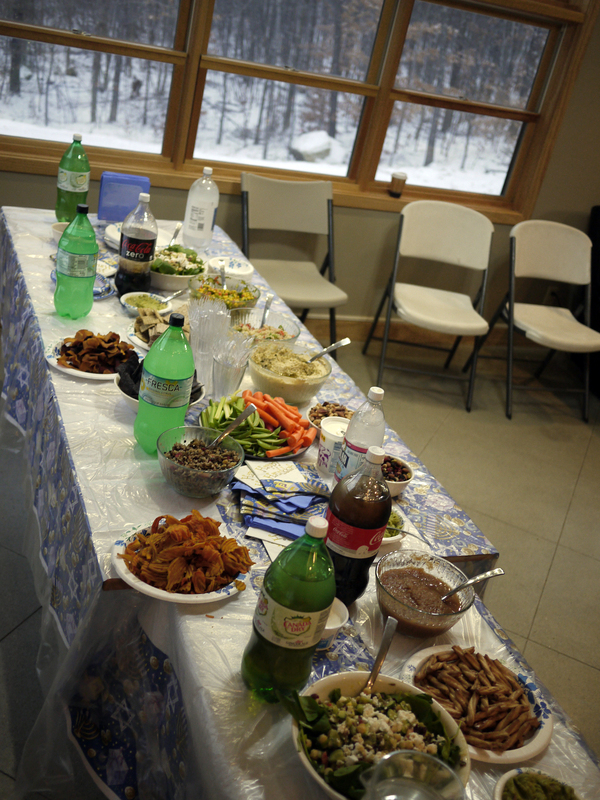 All 72 latkes went quickly, but there were homemade chalav yisrael enchiladas, the usual chips, crackers, nuts and pretzels, plus lots of different salads: quinoa, spinach, corn relish, curried rice, hummus. There were dozens of decorated sugar cookies (my daughter had mailed me Chanuka-themed cookie cutters earlier in the month) that I made the week before and stored on the porch (where they stayed fresh due to freezing temperatures), as well as 2 dozen sufganiyot that I brought from a bakery in our home town two days previously. I was able to buy Chanuka-themed paper goods at a local discount store ironically named "Christmas Tree Shops." Unfortunately, boxes of Chanuka candles were nowhere to be found, no matter where I shopped. Luckily I had brought some extra boxes of Chanuka candles from my home town. 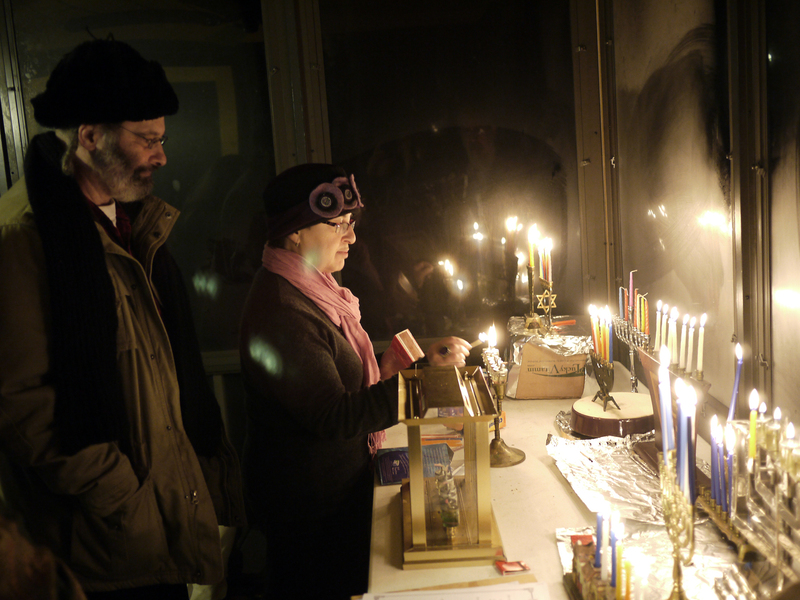 Rabbi Wilansky, the Chabad rabbi from Portland, is second from right. The fellow on the far left is from Australia. 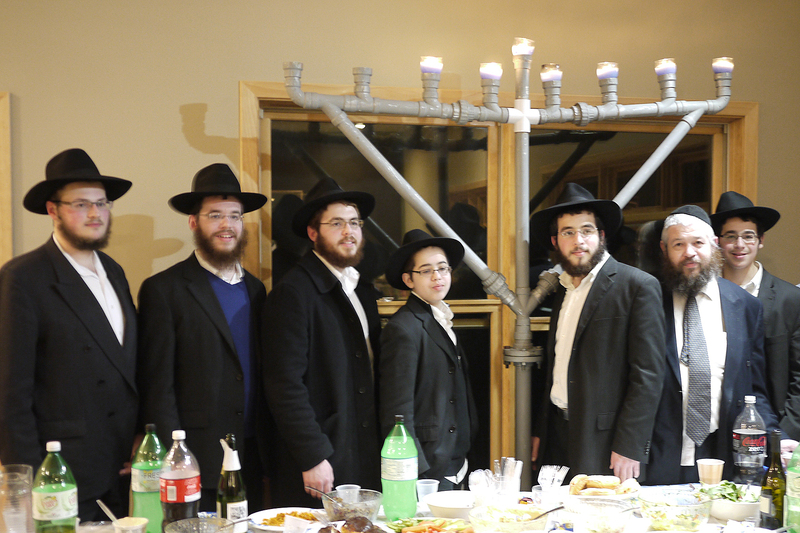 The others are some of Rabbi Wilansky's sons, on Chanuka vacation from their yeshiva in Crown Heights in Brooklyn. They danced around our living room to the amusement of our Maine guests, and as the hour grew late, people began saying their goodbyes. 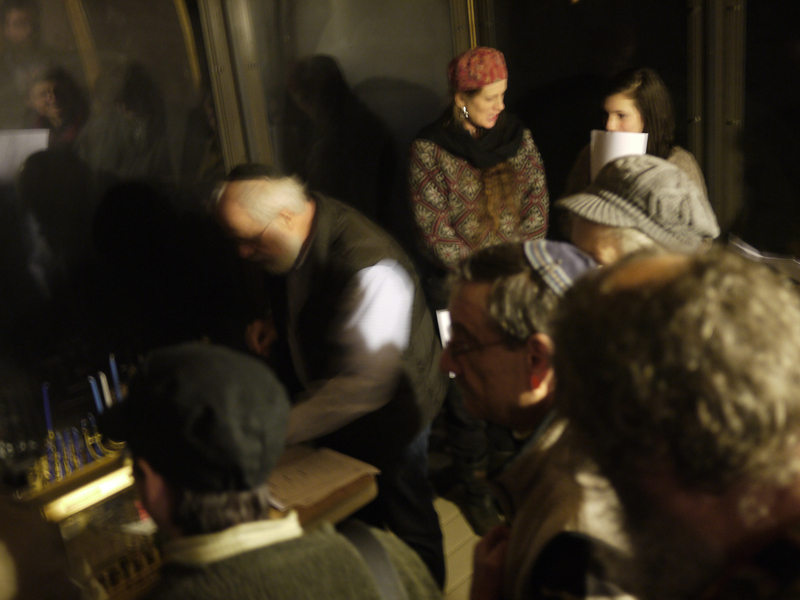 We felt very blessed that we had a maariv minyan in our home. It was a night of so many “firsts” and we are very glad we had returned to Maine for the remainder of Chanuka so we could make this party happen. It was also our first opportunity to have our own Chanukat HaBayit, to celebrate our new home. It also enabled us to meet many new potential friends and affirm that right now we are in the right place at the right time. We’ve experienced and celebrated so many little miracles since we’ve made this crazy move to Maine. When we were looking to buy property in rural Maine, we were concerned about anti-Semitism. We were pretty sure that people in small, homogeneous Maine hamlets had never met a Jew in their lives. I had been told that people in Maine could be wary of people “from away” but everyone we met seemed welcoming and friendly. Then again, they didn’t know we were Jewish. So when we went to the Town Office to let the Town Clerk know that we had bought property and would need to record the Deed, we were somewhat apprehensive, to say the least. Imagine my surprise when after presenting our request, the Town Clerk looked us up and down, put down her paperwork, stood up, and came over to embrace me. “MAZEL TOV!” she cried. My jaw dropped to my chest, I was so flabbergasted. The Town Clerk told us she grew up in a rough Irish neighborhood in Boston, but many of her neighbors were Jewish and she always admired and loved them. She was happy that we would be moving to the area. I only hoped that the other villagers would share her sentiments. I certainly planned on laying low in the meantime. Meanwhile the Town Clerk “adopted” us. She was extremely helpful in referring us to various workers and services that we required. She told us of great hiking and biking spots, gave us the names of a good veterinarian and doctors, and the location of the best bargain shopping venues. Besides her job as Town Clerk, she was also the Town Tax Collector. There was nothing she didn’t know, personally and professionally, about each and every resident in the town. It seems that the Town Clerk had mastered the art of Jewish guilt. 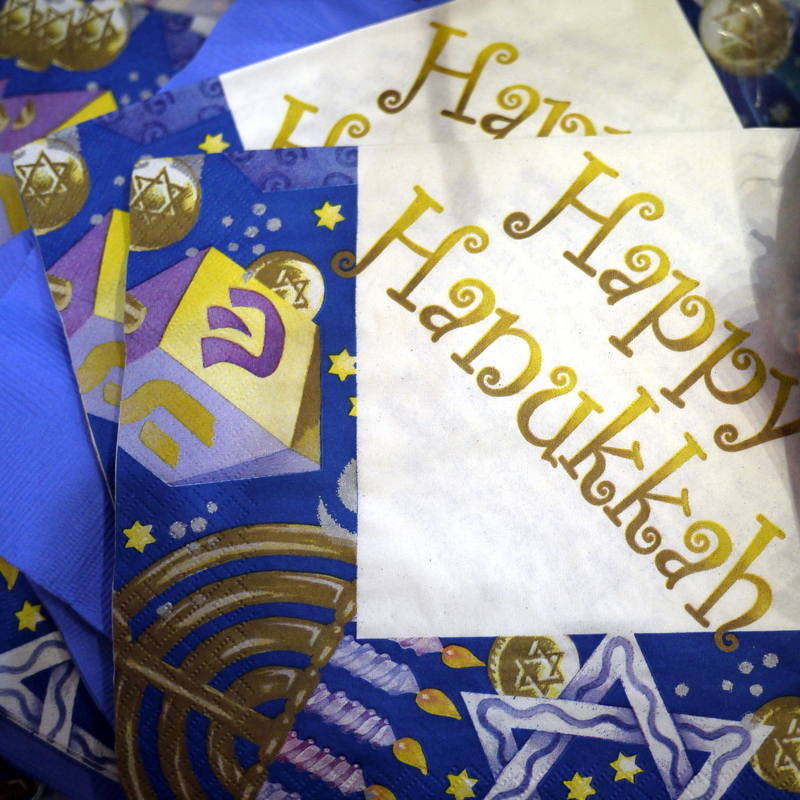 The last thing I wanted to do was speak about Chanuka at a “holiday party.” Who are we kidding – – it wasn’t a “holiday party,” it was a Christmas Party, where we simply don’t belong. I don’t have any problems with a Christmas party – – if it’s for Christians. My fear is that the townspeople, who until now have celebrated Town “Christmas Parties”, would suddenly be faced with a new phenomena under the guise of political correctness called a “Holiday Party.” And I would be held responsible for that change, a change I did not seek and did not want. I know that gentiles are very resentful that Christmas has been taken away from them: they must now wish everyone “Happy Holidays” lest Jews, Muslims, atheists and the ACLU be offended. Some public schools are no longer able to put on their annual Christmas pageant nor sing carols or have a decorated tree, all in the name of separation of religion and State. Personally, I say let them have their holiday. I don’t feel like Chanuka has to “compete” with Christmas nor do I think that the presence of Christmas (decorations, songs on the radio, and excessive gifting) threatens my Jewish identity. Nor do I think my concerns were unwarranted vis a vis my little Town. The next town over has a billboard sign that reads, “It’s okay to wish someone Merry Christmas!” So the last thing I wanted to do was impinge Chanuka on the townspeople, who couldn’t care less about the significance of Jewish holidays, especially one that is smack in the middle of their own merry-making. But our Town Clerk would not take “no” for an answer, so I decided to address my concerns to her in person. Filled with trepidation, I came to her office to give my little speech. I told her how much we appreciated her helpfulness and how nice it was to be welcomed in such a friendly manner. But that we simply felt uncomfortable about attending the party and hoped that she would forgive us if we declined. Our Town Clerk is a friendly, giving person, but trust me, you don’t want to be on her bad side. That’s when her rough-and-tough upbringing comes to the fore. She is a small, tomboyish woman with very short hair and a large presence. She looks and acts tough, and can out-swear any sailor. So imagine my surprise when, immediately following my little speech, she burst into tears. “Let me tell you something,” she said between sniffles. “I would never, never put you in a vulnerable position or in danger. By your refusing, you are telling me that you don’t trust me! That really hurts me!” and she continued to cry. I admit, she intimidated me into coming to the party. My husband spoke for 5 minutes about Chanuka while I passed out dreidels and Chanuka gelt to the children. I still felt uncomfortable, and couldn’t wait to leave. If our neighbors thought we were somehow “different” before, now it’s because we’re Jewish, instead of just being “from away.” We’re marked. The good news is that such a reality check forces us to examine our true role here as Jews. It’s an incredible responsibility to be an “ohr l’goyim” (a Light unto the Nations). We have to be super conscious of our every move, that we always speak and act in a modest, friendly, polite and responsible manner, that we are exceptionally honest in business dealings, and that we do not live in an ostentatious or unseemly manner. We have to make a Kiddush HaShem on an ongoing basis. There was one guest at the party who was also new to the Town. She and her husband moved here this past summer. And, as it turns out, they are also Jewish! So now our town has the distinction of being the fastest growing Jewish community in the entire United States: we doubled our Jewish population in six months! From two people to four (in a town of 234 souls). Watch out . . . soon we’ll be taking over . 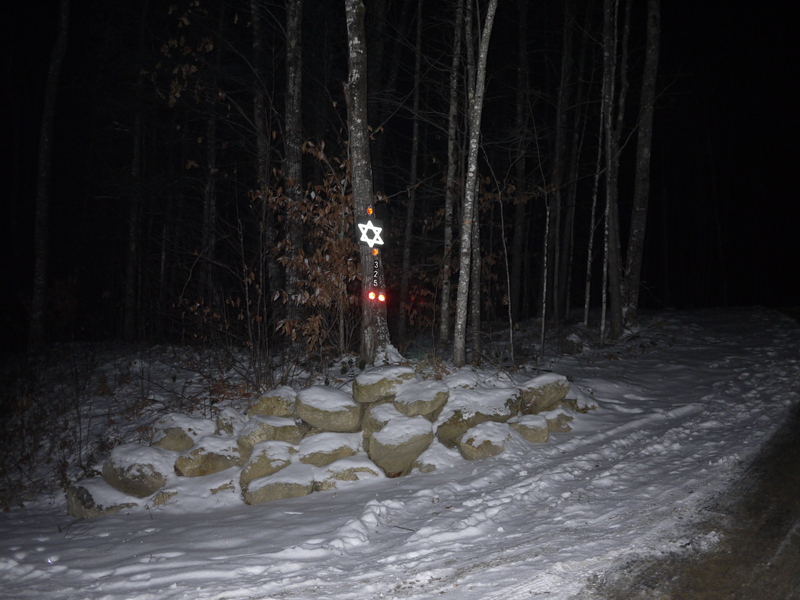 . .
Not that he could drive up our steep, icy driveway. The previous night and that morning we had sleet and snow, making the driveway impossible to navigate unless one has 4WD. It was truly treacherous, and our snowplow guy was nowhere to be seen. We had left instructions earlier in the day for our guest to stop at the bottom of the driveway and honk several times. Our guest drove his car a mile up the road to the Inn, where he parked, and my husband shuttled him back to our house and up the driveway in our SUV. He once spent a Shabbos with a shomer mitzvos rancher in North Dakota. This fellow raised prize-winning goats who were renowned for the quality of their milk and cheese. He showed our guest many pictures of his kids on horseback, working the ranch, lassos in hand. The rancher was a ger (convert to Judaism). He home schooled his children, teaching them Torah. When they got older, they wished to study in yeshivos in Israel. Lacking tuition money, the rancher sold all his ranchland except for where his house stood, so his kids could have a yeshiva education. Talk about mesiros nefesh (sacrifice)! 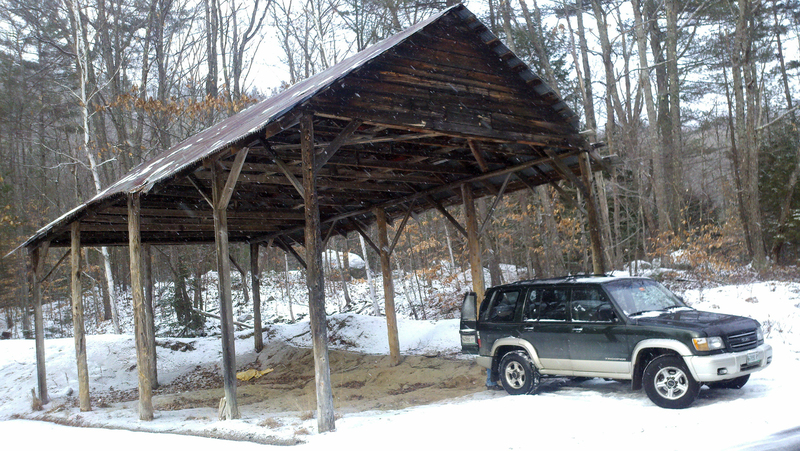 Aaron has been to the White Mountains on several occasions and loves anything to do with nature. So when he saw us listed on shabbat.com under “Maine” he knew he had to check us out (he had hoped to bring two other bochrim, but they chickened out – I guess they couldn’t believe anyone could be truly shomer kashrus and shomer Shabbos in the middle of nowhere). Fortunately we had just come back from our home town, so I had a healthy supply of chalav yisrael dairy products, although I did ask him to bring me a 1/2 gallon of chalav yisrael milk on his way up from New York. Besides preparing for our Shabbos guest, I was busy cooking and baking for our upcoming Chanuka party this coming Sunday. I made challah from 15 lbs. 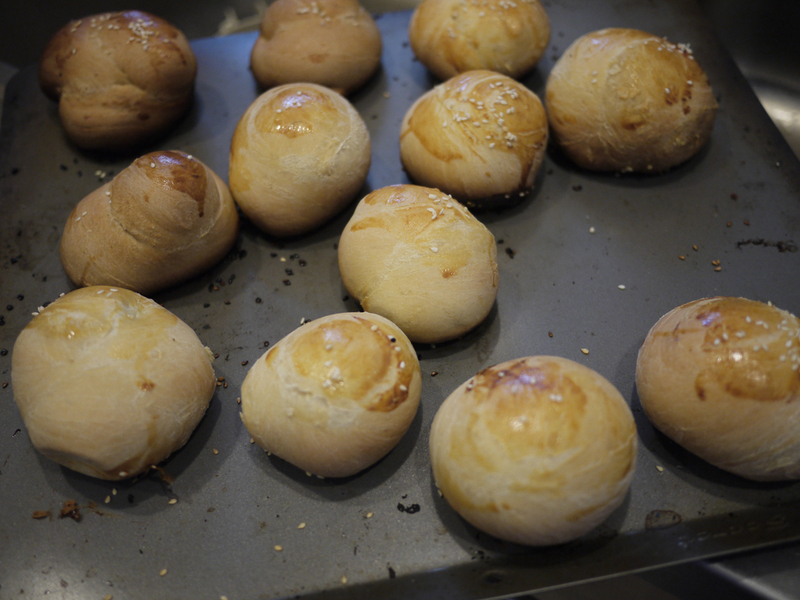 of flour – that’s dozens and dozens of rolls. It was when the rolls were rising that the oven broke. Our Premier-brand range has been the bane of my existence. We bought this particular brand because, due to our limited solar panel-fed electricity supply, it doesn’t use a “glow bar” to light the oven, which is a huge surge of electricity that we couldn’t spare. Instead it uses an electronic ignition spark to light a pilot, which then lights the stove, which is a system that is “old fashioned” and hard to find today. The stove, however, is a lemon. It is under warranty, but each time something goes wrong, the store I bought it from – some 65 miles away – won’t warranty repairs, so they tell me to bring the stove back and then they give me a brand new one. Sounds good, but I then have to pay the local gas company to install it and convert it for propane use, so it’s not the bargain it sounds like when you also figure in time, trouble and travel gas and other expenses. And each subsequent replacement stove has been a lemon, too. Lately the oven has been working on some days, and other days, not. A call to the manufacturer diagnosed the problem, and since it is under warranty, a new part was mailed to us. That was several months ago, but then the stove suddenly started working again, so I thought it was foolish to call and pay a repairman to come and install the new part. 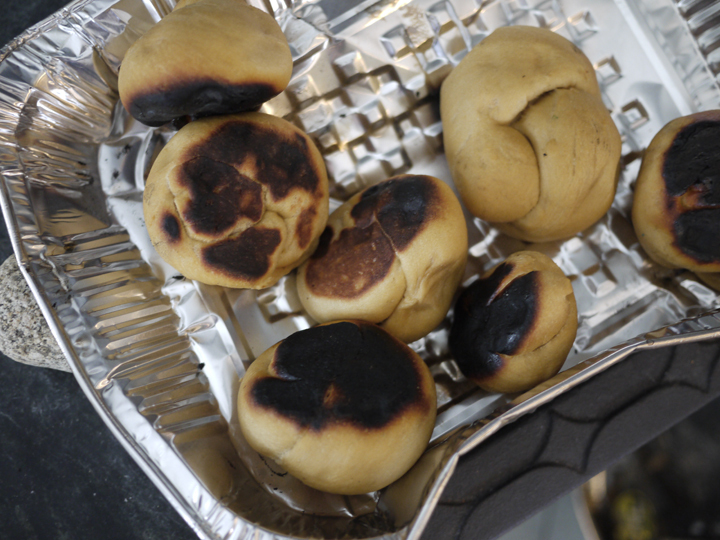 Alas, the oven decided to rebel on erev Shabbos, and it was erev Xmas to boot. Which meant that getting a repairman would take a Chanuka miracle. As he worked on the oven with a hex wrench, a pliers, and a drill, I was frantically calling repairmen across the state of Maine, as well as looking up manuals on the Web. Of course most repairmen couldn’t come, or knew nothing about my particular brand of stove. Finally I found someone about 100 miles away, who was actually familiar with my range. He guided my husband by phone, but even with the new part installed, it wasn’t working properly. Now the stove turned on, but the oven ignited with a whoosh and flames shot high into the air. While this was going on, I was frantically trying to bake my challah rolls. 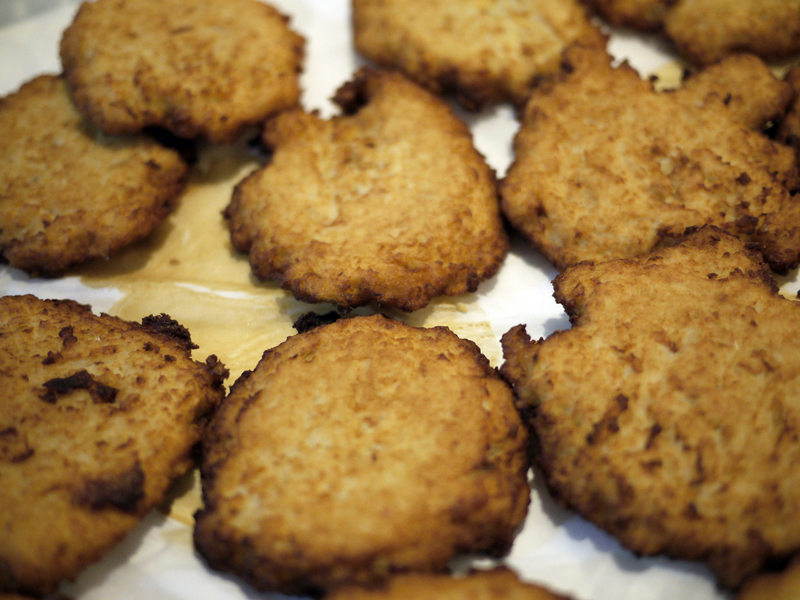 I put a batch into my woodstove, but it was way too hot, and the bottoms burned black and the middles were still raw. Our woodstove was designed as a home heater, not a cook stove. 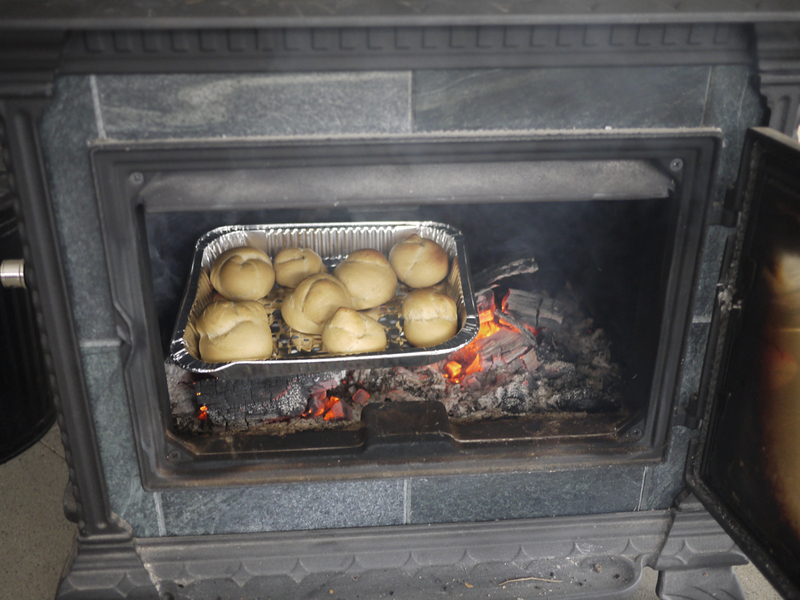 The woodstove was too hot for the challah rolls! What's a balabusta to do? Desperate times call for desperate measures. Oy! Charred on the bottom, raw in the middle. Then I tried inverting a black cast iron frying pan along the bottom of the fire, and placing the rolls on a tray above the pan. 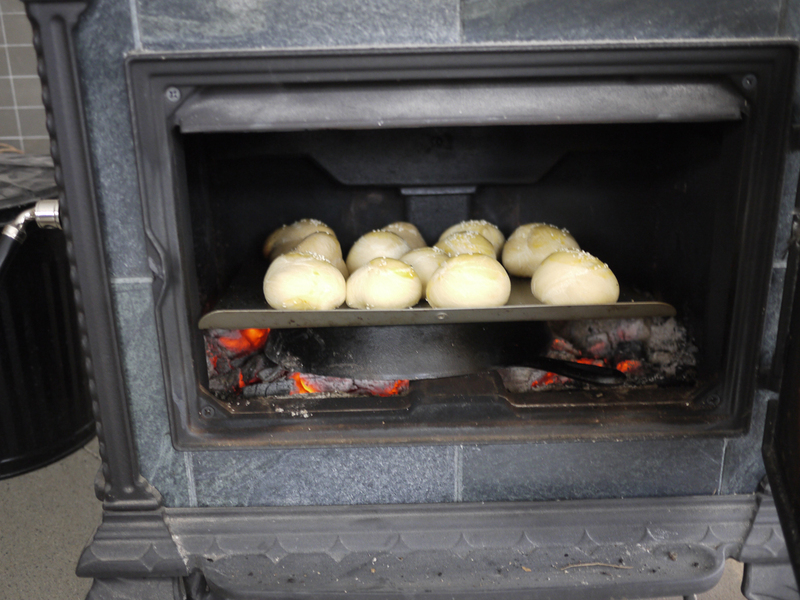 This would have worked but the stove was still too hot, so the bottoms of the challahs still burned, but at least the middles were baked through. The clock was ticking – – Shabbos was in 90 minutes. 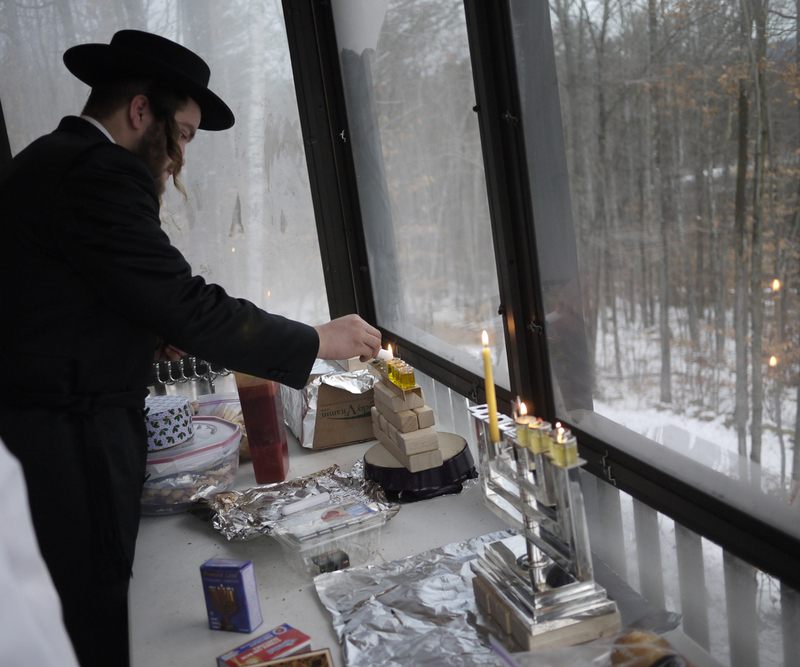 Quickly I put the rest of the challahs and Shabbos food in the oven, and just as everything was done, it was time to light our menorahs. 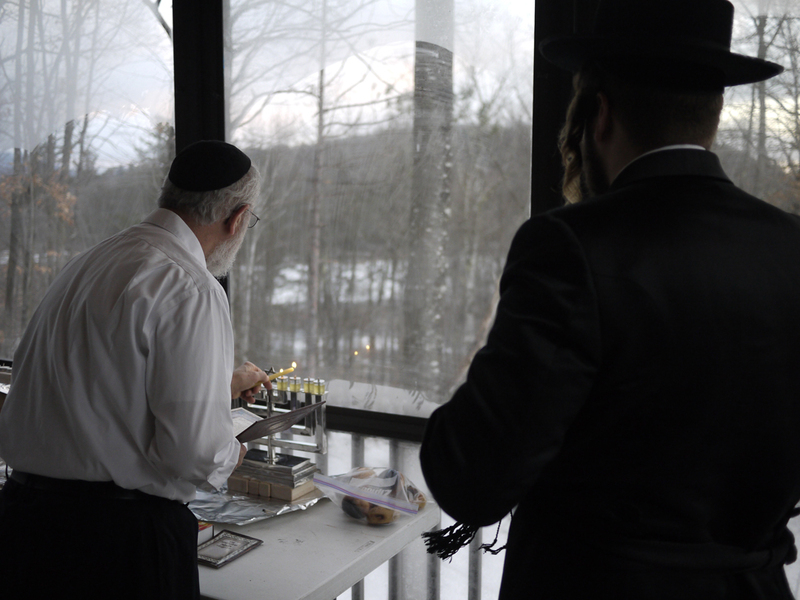 I would venture to say it was the first time in the history of our 177-year-old Maine town that Chanuka candles have been lit! Today we attended a bris, then made a condolence call, then went to an engagement party. Man plans, G-d laughs. Although we planned to be in Maine for Chanuka, we got a call Thursday afternoon from our home town that our next-door neighbor’s father died. Immediately we began making plans to return so that we could be menachem avel, to offer our condolences. 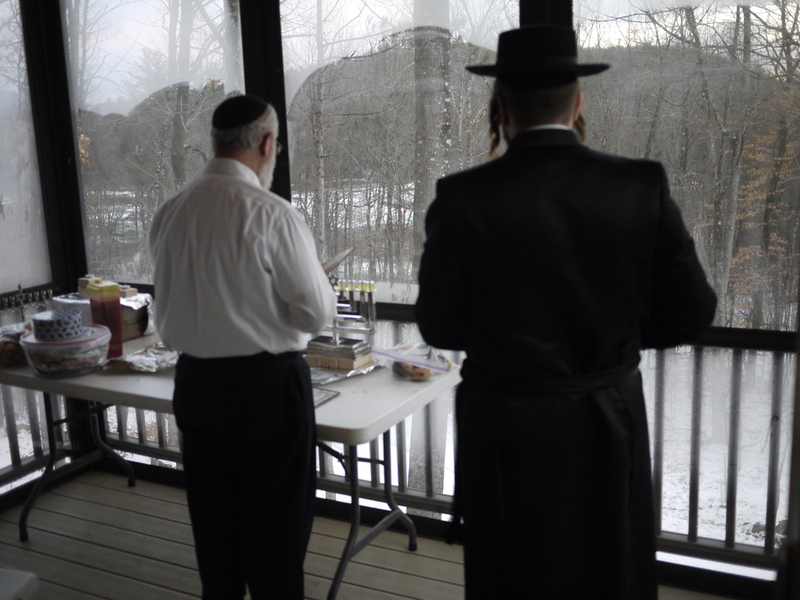 My husband, who is good friends with our neighbor, wanted to be part of the shiva minyan as much as possible. Our relationship with our neighbors began exactly eight years ago, when we moved to a secular Jewish neighborhood about a mile from our old, heavily Orthodox one. “My name is Liba*!” our pretty Russian neighbor announced at our doorstep, the day that we moved in. “Actually, my name is Luba, but my husband and I just went to our first-ever Shabbaton, and the rabbi there told me my Hebrew name is Liba!” she said, clearly delighted. “And this is my husband, Misha. * The rabbi told us his name is Moshe in Hebrew, but my husband isn’t yet ready for any name-changing.” She nudged her husband, who appeared somewhat shy, as he flashed an embarrassed smile and rolled his eyes. “Just call me Misha,” he said, his hand outstretched in welcome. “For now!” said his wife, smiling. As we got to know our Russian neighbors in our new neighborhood, we were constantly amazed by their desire to learn more about their Jewish heritage. Their teenaged son also had questions. Fortunately at his heavily-Jewish public high school, there was an extracurricular Jewish students’ union where he could ask a rabbi some of the questions that weighed on his mind. 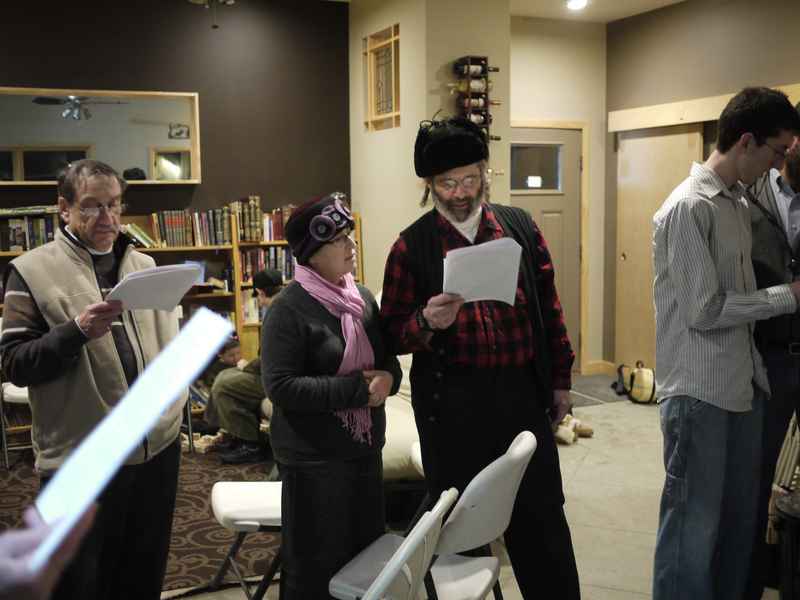 As the months went by, Liba and Misha not only attended classes about Judaism, they began holding monthly get-togethers for other Russian Jews in their home. From ages 5 to 85, religious and secular, about 80 (!) 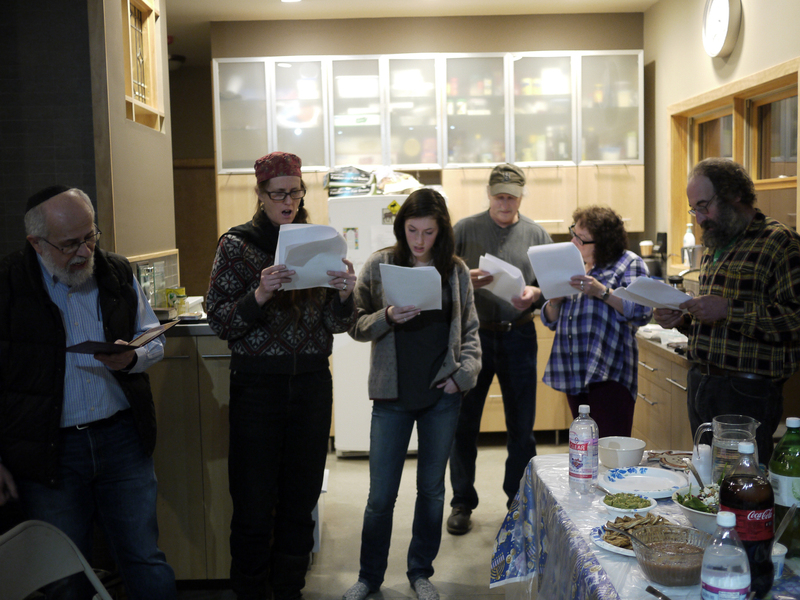 Russians flocked to our next-door neighbors’ home each month, anxious to hear a wide variety of speakers who stimulated them intellectually and spiritually (while enjoying the delicacies produced by Liba in her new kosher kitchen). It was a gradual process: Liba passionate and spiritual, Misha thorough and rational; but eventually the couple and their son became shomrei mitzvot. 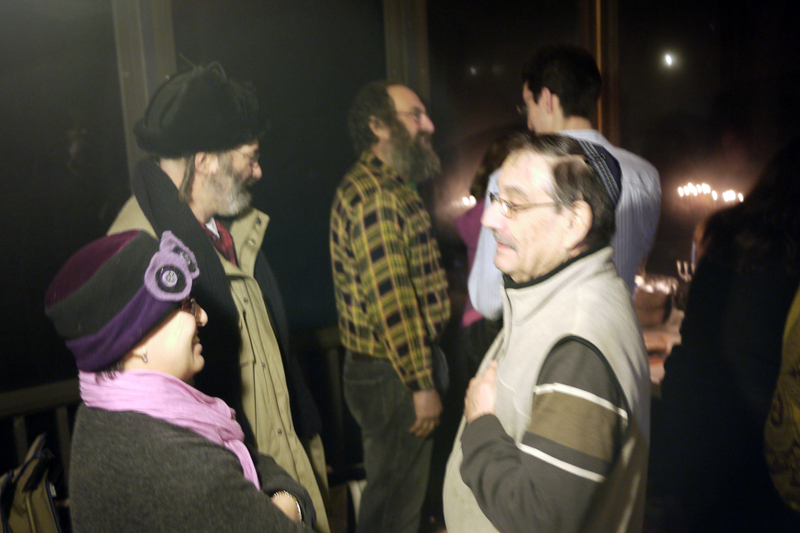 Soon Misha was remodeling again, this time converting his basement into a small shul complete with mechitza, hosting a Sabbath minyan in their home that brings in more Jews from around the neighborhood, both Russian and American-born. And then, at age 50, Misha had a bris. His brother, a secular Jew, followed a couple of months later. “I am so grateful,” he said at a celebration of the event a few days following the procedure. 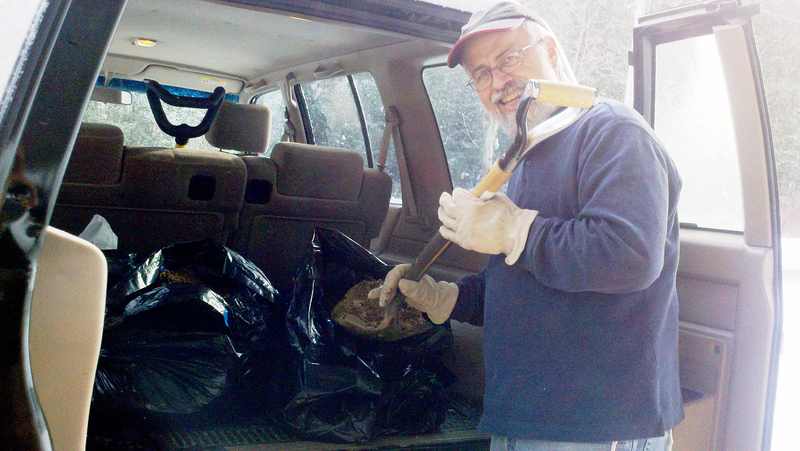 “Wow, you are truly my hero, Misha,” my husband remarked. “You think I am a hero for having a bris?” he asked. Living next to these remarkable neighbors has been a gift. We have learned so much from them, and we treasure their friendship so dearly. So how could we not return to our home town when we heard the news of Misha’s father’s passing, to be there for them during this difficult time? Although Liba and Misha tried very hard over the years to bring their father to the USA, it never worked out, and so the father emigrated with his other married son from Russia to Israel. There he was given a depressing, cinder block apartment in a poor immigrants’ neighborhood of similarly depressing and bare-bones apartments, all overcrowded, poorly built, and completely lacking in any aesthetic appeal. Misha’s father never really mastered the Hebrew language nor did he successfully integrate into Israeli society. But despite having been a heavily-decorated Russian war hero during WWII, he was always grateful to have left Russia to live amongst Jews. Once a year Misha’s father would visit from Israel, but the last time he came he was terribly frail. Then the terrible news came that his kidneys were failing, and it was just a matter of time. Misha left for Israel to say his goodbyes, to ask forgiveness of his father, and to hire a private caregiver. A few weeks after Misha returned to the US, his father entered the hospital. When there was nothing more to be done medically, he was sent to a nursing home, where he died a few days later. Speaking with Misha at the shiva, he told me about his final visit with his father. “You know, the rabbi came this morning to pay me a shiva call, and he asked me, ‘how did your father support himself’?’ And I told him, my father was from the previous generation. He didn’t need money to live. He had no need for things. Whenever I would come to Israel to visit, I would give him money. And the next time he’d come to America for a visit, he’d be giving my kids the money I gave him. He so enjoyed passing out those dollars like some sort of rich person! “When I went to visit him the last time, I stayed in his apartment while he was in the hospital. And I looked around and thought, ‘how did he manage it? To stay in this depressing tenement for so many years, with the crude plumbing and ugly surroundings? “And then I thought to myself, ‘Misha! This is the Land of Israel! I must find something positive, to try to see it through his eyes, and then maybe I would get some understanding. “So I looked around the apartment, and saw all the pictures on the walls – photographs of me and my wife, my brothers, our children and grandchildren – – and I realized that this was really what his life was about, his family; and the ugliness of the apartment and its surroundings just didn’t matter to him because it was his family that was important. “And then I stepped outside. I was determined to see past the mangy cats, the trash, the dirtty buildings, the dog excrement on the sidewalks. Because that was all I could see before. And I saw that it was a cold, but very clear day. The sky was blue, the air was clean; the sun was shining and there was a wonderful breeze. And everyone around me was Jewish. There were all kinds of people on the street – but they were all Jewish. And they were free, and living in the Land of Israel. This, too, I saw through my father’s eyes. And it gave me great comfort. “You know, the hospital was an amazing place, also all Jewish, and the care was very good. But then when it became clear that there was nothing more to do, they couldn’t keep him there. And they sent him to a nursing home.